Dearborn, MI – November 2010 – AMPRO, which was headquartered in Northeastern Alabama, occupied a 160,000 square foot facility and utilized molding presses up to 3300 tons. It was privately held. The following two paragraphs were taken from the official IAC press release. DEARBORN, Mich. (November 22, 2010) – International Automotive Components Group (IAC), a global tier-one supplier of vehicle interior components and systems, today announced that it is acquiring automotive interior component supplier AMPRO Molding, LLC, based in Anniston, Ala. AMPRO is located in close proximity to key OEM customers based in the southeast region of the U.S.
AMPRO manufactures a variety of vehicle interior components that align with and enhance IAC’s current portfolio of products. 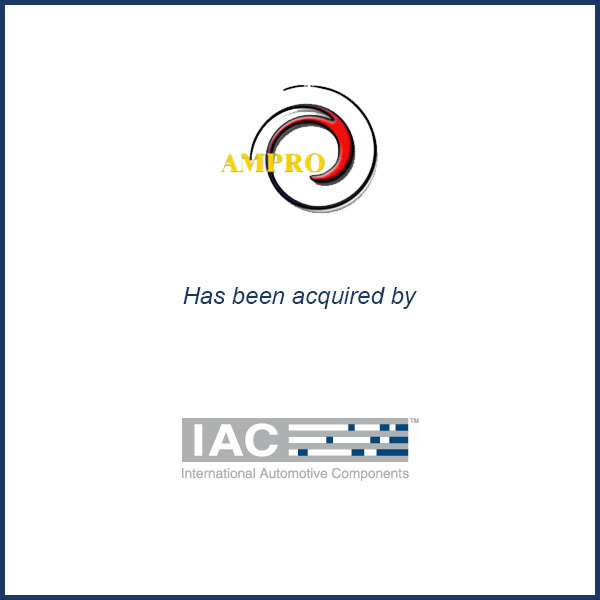 The AMPRO acquisition reinforces IAC’s commitment to establish facilities near its OEM customers, while enhancing its technical and product portfolio for the global automotive industry. MBS was the exclusive advisor to AMPRO Molding in its sale to International Automotive Components in November 2010.